This Detective review was made after playing through three of the five cases. What is Detective: A Modern Crime Board Game? In Detective: A Modern Crime Board Game, you and your fellow detectives attempt to solve five cases by following leads and using your investigation agency’s database. 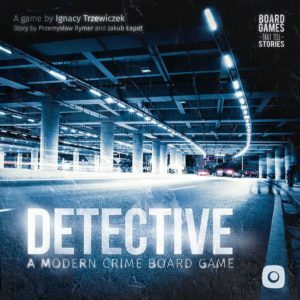 Detective is published by Portal Games and was designed by Ignacy Trzewiczek, Przemysław Rymer, and Jakub Łapot. You’ll have a specific number of days to solve each case in Detective. Work days are usually from 8:00 AM to 4:00 PM, but you can work overtime at the cost of one Stress token per hour. The casebook will tell you exactly how many days you have and your stress limit for each case. If you reach your stress limit, the case ends immediately and you’ll have to turn in your final report. After reading the case introduction and any special instructions, it’s pretty much up to your group to decide how to proceed through the entire case. The casebook will give you a few leads to start out with, but after that you’ll have to find the leads yourself. For example, the casebook might tell you to grab card “#615 – Headquarters” to check police reports for something, and then that card might have more leads. At the start of the game each player will get an investigator tile. Any unused tiles will be flipped to their “Consultant” sides. Most of the tiles will give you some starting skill tokens, and your investigators will give you abilities you can use once per day. The skill tokens are important because they allow you to “dig deeper” into leads when you want to. You’ll also have some Authority tokens, which are sometimes required to follow leads. Most of the actions you take cost time, which will be shown at the top of lead cards. You’ll want to choose your leads carefully since you only have so much time to complete the case. Some of the leads really are helpful, while others will waste your time. It also takes one hour to move from one location to the other. You’ll be using the Antares Database website quite a bit during each case. This is where you’ll be able to look up information on people of interest in your case. You’ll be looking up personal files, interviews, fingerprints, DNA, and a whole bunch of other important info. Once you’ve looked anything up in the database, it’s there for the rest of the campaign. It never costs you any time to use the database. There are also times when you’ll be able to search online for information. Some cards and database entries will include Wi-Fi symbols that let you know that you can do some research on whatever is underlined. Once you’ve run out of time or you’ve reached your stress limit, you’ll go onto the Antares Database to submit your final report. You’ll have to answer some multiple choice questions and you’ll find out if you solved the case or not. If you fail, you can choose to try that case again or move on to the next one. Any of the lead cards that you read during your cases can be referenced during subsequent cases. Any cards that you didn’t read will be left in the box for the rest of the campaign. It’s extremely important that at least one person is taking notes while playing through each case. You’ll be following a lot of leads and you’ll be reading quite a bit of text, so you really can’t depend on your memory while playing Detective. This game really does make you feel like a detective. Pretty much right from the beginning of the first case my group was totally immersed. We were talking about the suspects like they were real people and we were actually interested in finding out if different elements of the case connected in some way. I won’t go into spoiler territory, but I will say that the cases are very interesting. They are very well-written and different than the cases you’ll find in other detective games. Since you have a limited amount of time and resources, there are a lot of tough decisions to be made. All of the answers are there in the decks of cards and in the database, but you have to decide what to pursue as a group and hope that you get enough information to solve the cases. This makes for some very tense and exciting gameplay. They did a great job on the Antares Database. It looks nice, it functions as you’d hope, and it really is a lot of fun searching through profiles and fingerprints. Detective is extremely easy to learn how to play. Once you know how the cards work, which only takes a few minutes, you’re ready to go. The game also has very quick setup and breakdown times. I don’t like that the whole case comes down to answering multiple choice questions on the website. You could end up solving a case even if you don’t actually know the correct answers. I would have preferred question and solution books like the ones used in Deadline. These cases are long, especially if you take your time with each lead like the rulebook suggests. One of the cases took my group close to four hours and only one of them took less than three hours. Some of the lead cards have a lot of filler text. You’ll read a lot about waiting for things and drinking coffee. If you’ve enjoyed playing detective games like Sherlock Holmes: Consulting Detective or you’ve always loved mystery books/shows/movies, there’s a pretty good chance that you’re going to have a lot of fun playing Detective: A Modern Crime Board Game. The cases are tough without being too frustrating and the online database brings something new to this game genre. 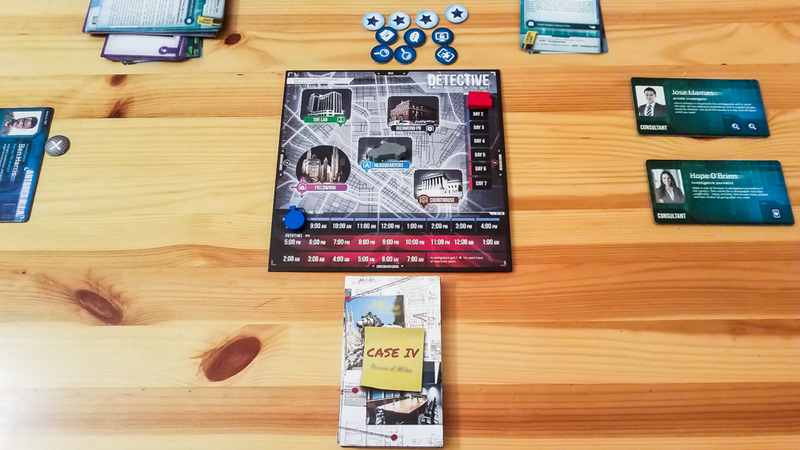 My group had a blast playing the first three cases and we’re really looking forward to playing the last two. Thanks for taking the time to read our Detective: A Modern Crime Board Game review! To stay updated on all things cooperative board games, follow us on Twitter, Facebook, or via RSS.